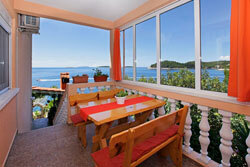 Villa Senija (Donjerković apartments) is located in bay Karbuni, only fifteen meters from the sea! To our guests we offer completely arranged apartments with terraces/balconies and direct sea view to the nearby islands; air-conditioner, satellite TV, possibility to internet access! Each of apartment has its own entrance. Every guest is provided parking (available for car access to the apartments), private beach, shower outside and a berth for smaller or larger boat, yacht or boat. Karbuni is a charming tourist bay on the southern coast of Korčula. It is sheltered port, well protected from winds. The authentic island landscape with stone terraces of vineyards and olive groves is even more special due to the islets along the coast. The largest islet is Zvirinovik. Islets are only a few hundred meters away from the coast and they are perfect for relaxing, snorkelling, diving and kayaking. Karbuni is ideal for those who want to spend quiet family vacation in apartments, rooms or vacations houses in the unspoiled nature. The island has a number of famous towns including Korcula, Lumbarda, Blato and Vela Luka. The oldest written monument in Croatia, the "Lumbardska psefizma", in Greek, was found in Lumbarda.